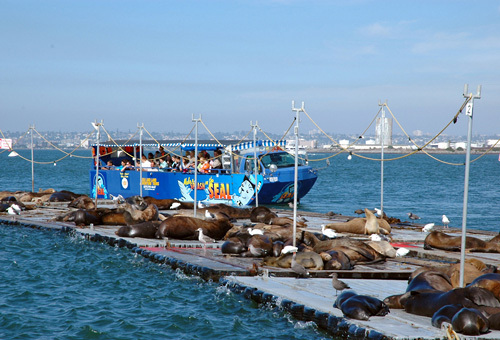 Featuring 90-minute, fully narrated tours that depart from Seaport Village and Embarcadero, San Diego SEAL Tours offers an exciting family-friendly experience from atop a boat on wheels. 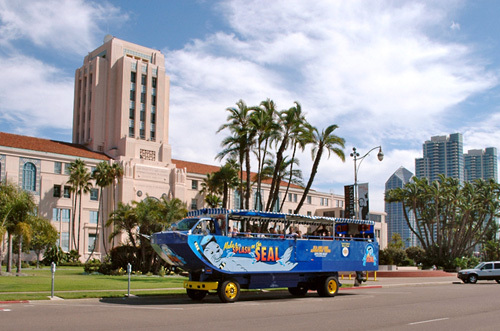 The tours are held on amphibious vehicles—guided by seasoned captains—that travel through the scenic streets before diving into the cool waters of the San Diego Harbor, where many California sea lions call home. The name SEAL is a tribute to the Navy Seals. Cruises both land and sea. Splash down into San Diego Harbor. Make a Splash on the SEAL! Experience San Diego as it was meant to be experienced... by land and by sea! 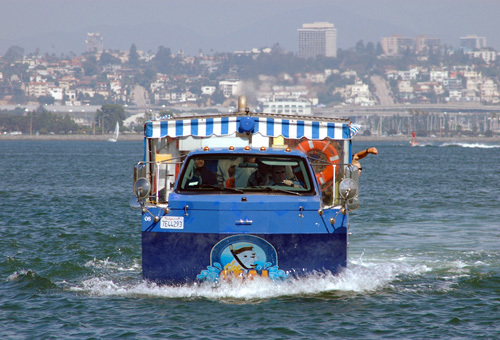 The new "Hydra Terras" provide you with the unique ability to see America's Finest City on San Diego's only amphibious sightseeing tour. This 90-minute fully narrated journey departs from Seaport Village located at 500 Kettner Blvd. As you travel along the beautiful Big Bay by land, you will learn about the early fishing industry, the people as well as the history of this 14-mile long working bay. The tour on land takes you past the San Diego International Airport dedicated to aviator Charles Lindbergh, just one of the many people you will hear about on your tour. 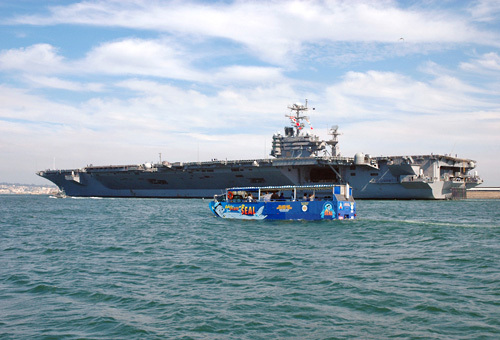 The return trip takes you, once again, back up on land where you will return to your starting point via Harbor Drive while you pass the Maritime Museum, the Cruise Ship Terminal, and the USS Midway Museum. 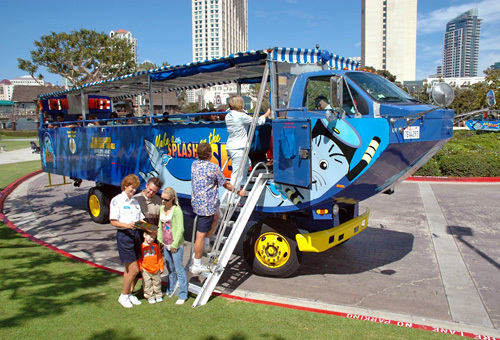 The San Diego SEAL tour fleet consists of 5 amphibious vehicles manufactured specifically for the tourism industry. These vessels are completely U.S. Coast Guard approved and meet all required regulations for Department of Transportation passenger vessels. Every effort has been made to make these vehicles the strongest and safest possible. 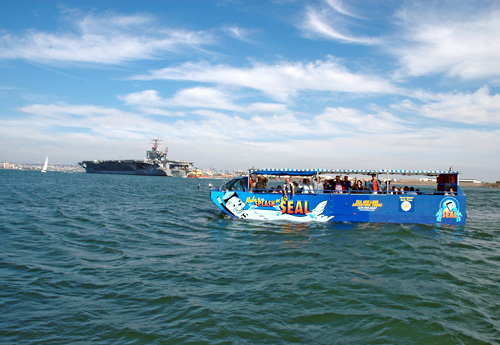 Reserving a Tour Time must be made at the SEAL Tour ticket booth located at Seaport Village at 500 Kettner Blvd or at 1492 North Harbor Drive (seasonal). Please refer to complete instructions on eTicket voucher after purchase. The San Diego tour is 90 minutes total with approximately 30 minutes on land and 60 minutes on the water. Seaport Village only: We have the ability to handle wheelchairs and scooters with a manual lift available at the boarding location. 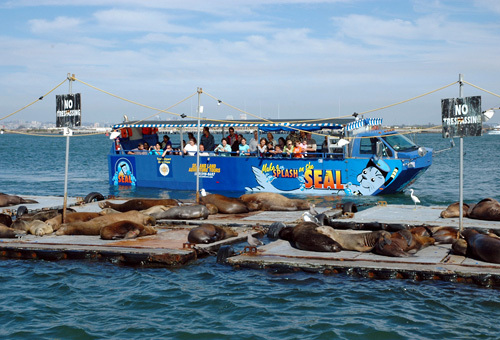 Please contact San Diego Seal Tours directly for accessible available tour times. Yes, parking is available at Seaport Village. Validated Parking: $3 for the first 2 hours or part thereof; $2 every 30 minutes thereafter or part thereof. Validation with a minimum $10 purchase from any Seaport Village establishment. Non-validated parking: $8 per hour or part thereof. Yes. We have a lock to keep your strollers safe at our ticket booth while you are on the San Diego harbor tour. We cannot be responsible for lost or stolen personal items.